A recent Masters graduate from the Royal Academy of Music, Matthew is an active recitalist both in London and in his native Hertfordshire, studying under the pedagogue György Pauk. At the Academy, Matthew was a pupil of Nicholas Miller and performed in masterclasses with eminent soloists such as Tasmin Little, Sylvia Rosenburg and Hartmut Rohde. Notable solo performances include Prokofiev’s 2nd Violin Concerto at this years prestigious London Masterclass Series, Mozart’s Sinfonia Concertante with the Cambridge Rococo Orchestra, Vaughan Williams’ ‘The Lark Ascending’ with Eton Chamber Orchestra and Sibelius Concerto, Glazunov Concerto and Vieuxtemps 5th concerto in recital at venues such as St Mark’s Regent’s Park and St Peter’s church St Albans. Matthew currently plays on an Ettore Soffritti violin, made c.1900 in Ferrara, Italy, which has been generously loaned to him by the Harrison-Frank Foundation. As a chamber musician, Matthew has received coaching from internationally renowned groups including the Henschel Quartet, Trio di Parma and Chilingirian Quartet and received regular tutoring at the Academy by Ian Brown of the Nash Ensemble. Significant chamber performances include Dvořák’s ‘American’ string Quartet at Conques Abbaye France, Fauré’s two piano quartets at St James’ Piccadilly, Messiaen ‘Quatuor pour la fin du temps’ at King’s College London and Brahms and Kapustin piano quintets at the Orpheus and Bacchus music festival in Bordeaux. 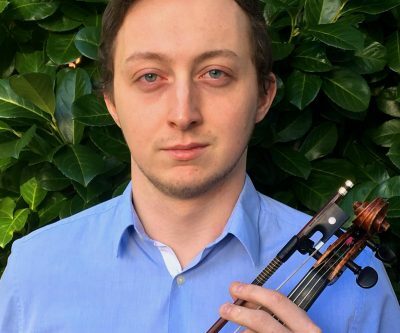 As a first violin in the Academy’s Chamber and Symphony Orchestras, Matthew has worked under the guidance of some of the world’s leading conductors, such as Semyon Bychkov, Sir Mark Elder and Yan Pascal Tortelier. Matthew, now 24, graduated from Cambridge University in June 2014, where he read biology as an undergraduate at Robinson College. During his three years there, he performed in the University Chamber Orchestra, working closely with Sir Roger Norrington, and founded the acclaimed Thurlow quartet and Alighieri quintet. Matthew played the Harrison-Frank Family Foundation’s Ettore Soffritti violin (HFF40) in 2017-2018.